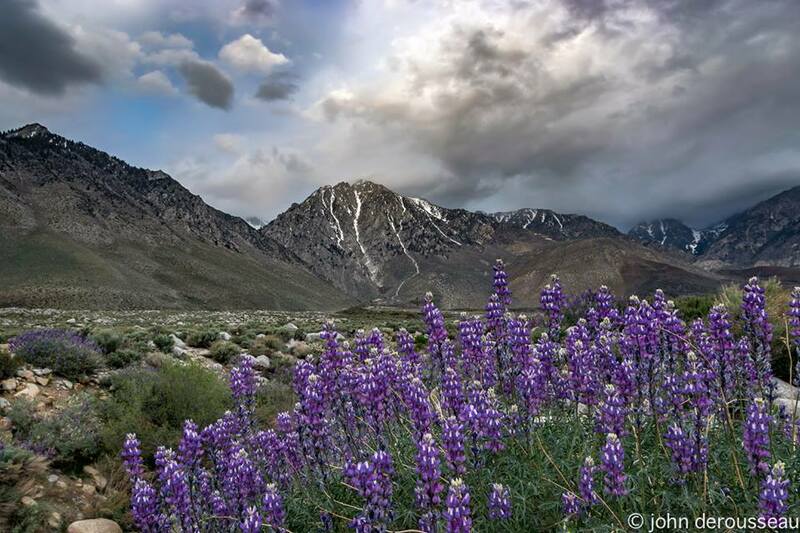 When Do Wildflowers Bloom in Death Valley, Owens Valley and the Eastern Sierra? Congratulations! 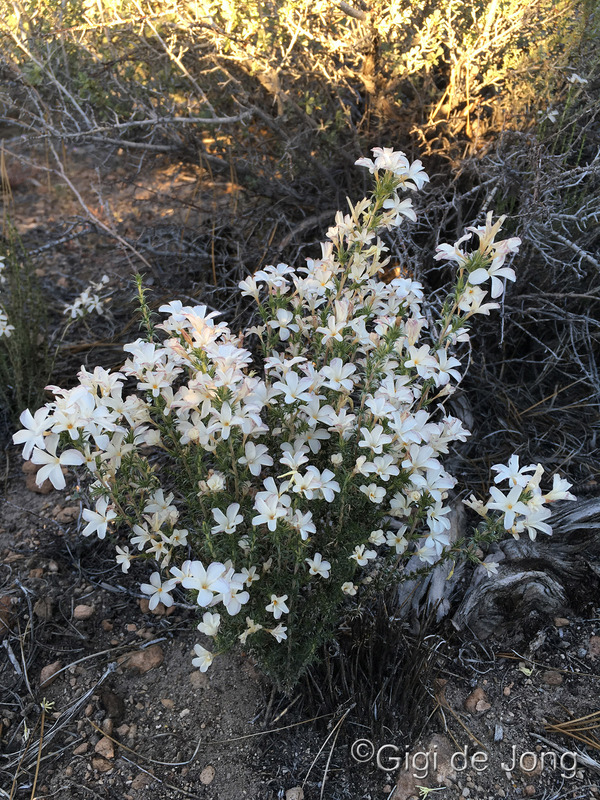 We have prepared some easy and quick directions for you to find great wildflowers in Southern California’s deserts and mountains. 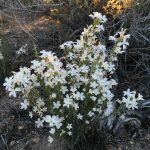 Botanists, who are plant experts, will tell you annual wildflower blooms in California’s low and high desert regions are difficult to predict, eluding the most determined enthusiasts’ attempts to catch wildflowers at a perfect time. Flower seekers commit to study and learn how water, temperature, wind and elevation work together to create the exact conditions for flowers to display vibrant color and broad distribution. These environmental factors determine the best and various locations for you as a wildflower aficionado to find the best blooms. As you get better finding wildflowers, you will find each year is different as to when they bloom, the variety of bloom, and density of their numbers. Committing to learn the tools below will increase your probability to find good desert wildflowers in spring and alpine wildflowers in summer. Then each year, use them to monitor, travel to and discover these seasonal treasures as other successful enthusiasts do. Water plays the most important role to help flowers germinate. The amount, pattern of rainfall and subsequent temperatures affect wildflower abundance and diversity. In some years, wildflowers carpet an area while other years will display few to none. Small doses of rain and regularity are best during winter. Too much rain can rot or wash away wildflower seeds. Too little rain lessens seed germination. Each season is unique to its particular wildflower bloom. Temperature is also essential. Warm days are a good indicator of a full bloom ahead. If it gets too hot, seeds will dry out. Very cold temperatures will prevent flowers from blooming. Also, frequent springtime windstorms without additional rain can bring about a quick end to the spring bloom or even prevent it from happening by killing off delicate sprouts. Wildflowers require almost a “Goldilocks – Just Right” scenario to produce good blooms. Death Valley, Owens Valley, and Eastern Sierra spring bloom periods for elevations of 1000 to 5000 feet occur usually from March through June; alpine wildflowers in the high Sierra begin in summer and can go into September. 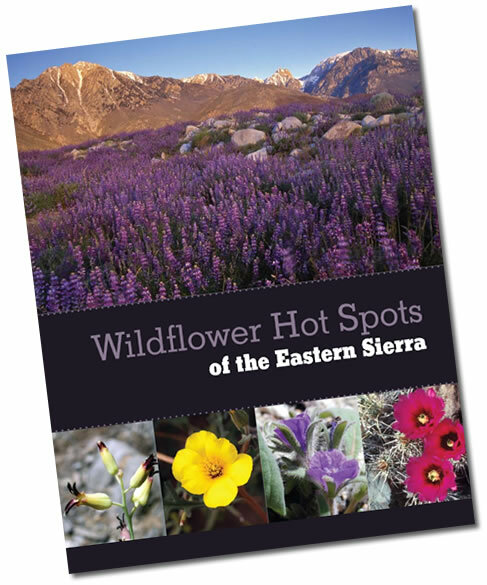 Stop at our chamber office when you come to Bishop to pick up a print copy of the Wildflower Hot Spots of the Eastern Sierra. We are located at 690 N. Main, in the A frame building across from Carl’s Junior Drive In. 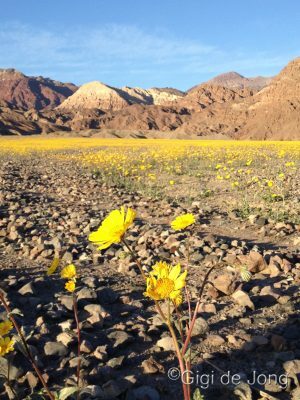 Have you heard of the wildflower “super bloom” that happens periodically in the deserts of the southwest? It’s a pretty special event that occurs in spring when conditions have been just right. But, don’t wait! Don’t wait for a super bloom to visit the Eastern Sierra to see the magic of wildflowers in a vast, untamed, and natural setting. Wildflowers bloom here every year and it is an experience that you can enjoy with the whole family any year, anytime from about early March to late September. 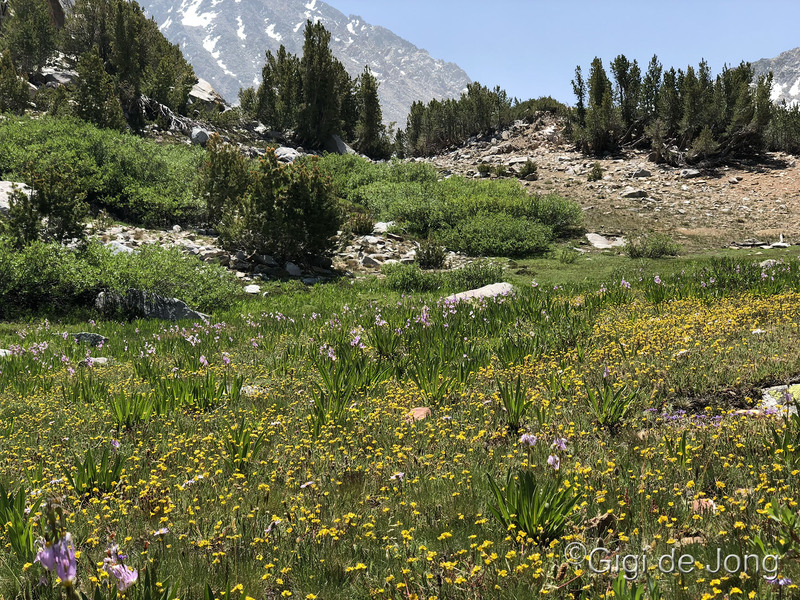 What sets the Eastern Sierra apart from many other desert wildflower regions is its extremes in elevation combined with a diverse geologic environment. It is also the intersection of three major biotic provinces – the Mojave, Great Basin, and Sierra Nevada – with the result that this region has a wide variety of vegetation communities. Thousands of species occur here and many are unique to the Eastern Sierra. Broadly speaking the Eastern Sierra is a region of eastern California that covers a vast area on the east side of the Sierra Nevada mountain range. It is a sparsely populated, high desert region that spreads across two counties, incorporates only a handful of towns, and has lots and lots of open land. The topography and geography of the region encompasses the deep Owens Valley, the tall and rugged Sierra Nevada to the west, the gentle giants of the White and Inyo mountains to the east, and the magnificent Mono Basin on the northern plateau. US Highway 395 is the main thoroughfare that takes travelers through this beautiful region that stretches from Little Lake in the south to Bridgeport in the north. 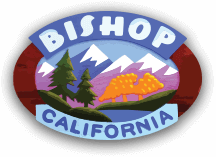 Bishop is located pretty much right in the middle of the Eastern Sierra at the northern end of the Owens Valley in Inyo County. This unique geographic region allows for a long and abundant growing season. Wildflower blooms are subject to many factors. Water and temperature are the key factors that dictate when and how many flowers will bloom. Elevation is a prime factor that determines temperature and precipitation. The lower elevation desert floor is hotter and drier and the higher mountainous regions are cooler and wetter. Therefore, blossoming occurs at different places at different times. 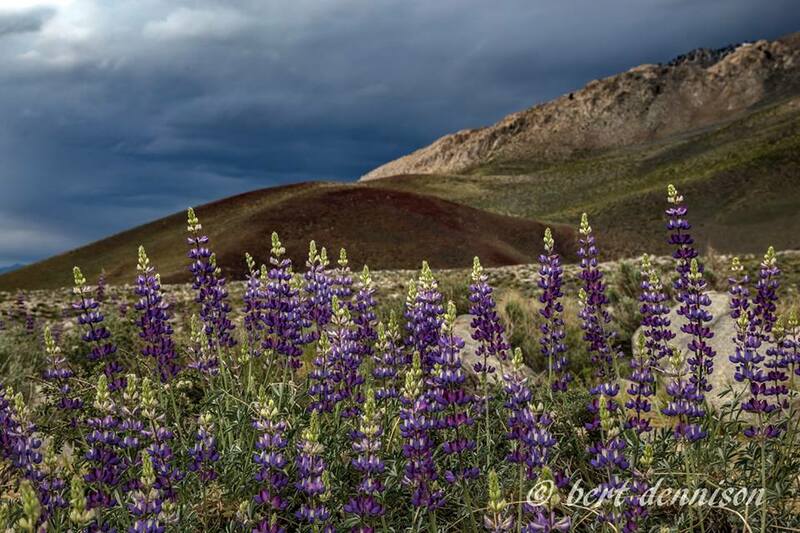 The long blooming season that occurs along the 150 miles of the Eastern Sierra wildflower corridor means that the window of opportunity to see some of the amazing flora of this region is over 6 months long. 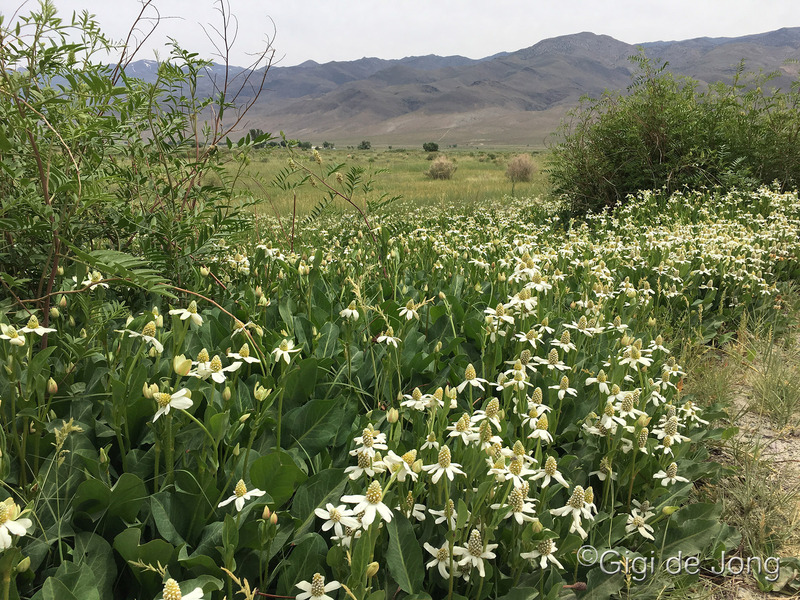 At the southern end of the Owens Valley, at about 3,300 feet above sea level, large tracts of open land can present carpets of color at the start of the season. In the upper elevations of the Sierra Nevada, with peaks that rise to well over 13,000 feet, the colorful blooms in the canyons and meadows bring the season to a close. The floral display begins at the lower elevations, beyond the Eastern Sierra in places like Mojave and Death Valley National Park, and then appears on the floor of the Owens Valley some weeks later. Thereafter the bloom grows in the foothills of the adjacent mountains and slowly creeps up the canyons and into the hanging valleys and meadows of the upper regions of these mountains. Visitors to the area can find out what is growing where at a moment’s notice during the growing season – or plan a special trip to see something specific. The latter might require a little flexibility around dates, but plenty of up-to-date information is available from the Bishop Visitor Center and other visitor agencies in the region. 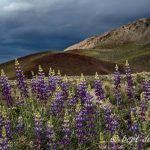 The wildflowers of the Eastern Sierra will hold a special appeal for nature lovers, outdoor enthusiasts, botanists, and photographers. It is also a wonderful time for families to get out together to walk, talk and learn about our amazing natural world. Wildflowers can be seen from the comfort of a vehicle, but viewing is best done on foot. A walk on the wild side of the eastside can be a magical experience. The great variety of flowers offers an opportunity for learning about our natural world in an untamed, natural setting. If you’re unused to the altitude you may find you get winded easily. Slow down … you’ll see more flowers that way too! 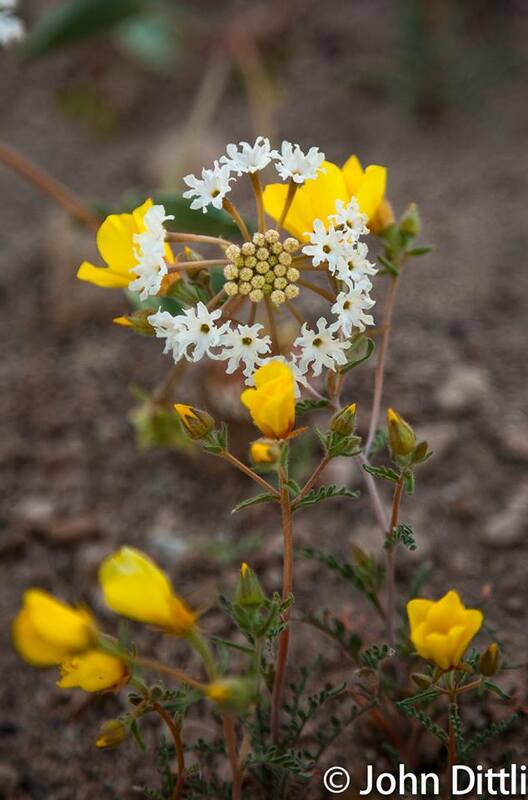 For those visitors from wetter climates it is important to note that many desert flowers are small and fine. The larger bushes of rabbitbrush and sagebrush sometimes obscure the floral carpet, but that’s not to say you won’t find fields of incredible color. 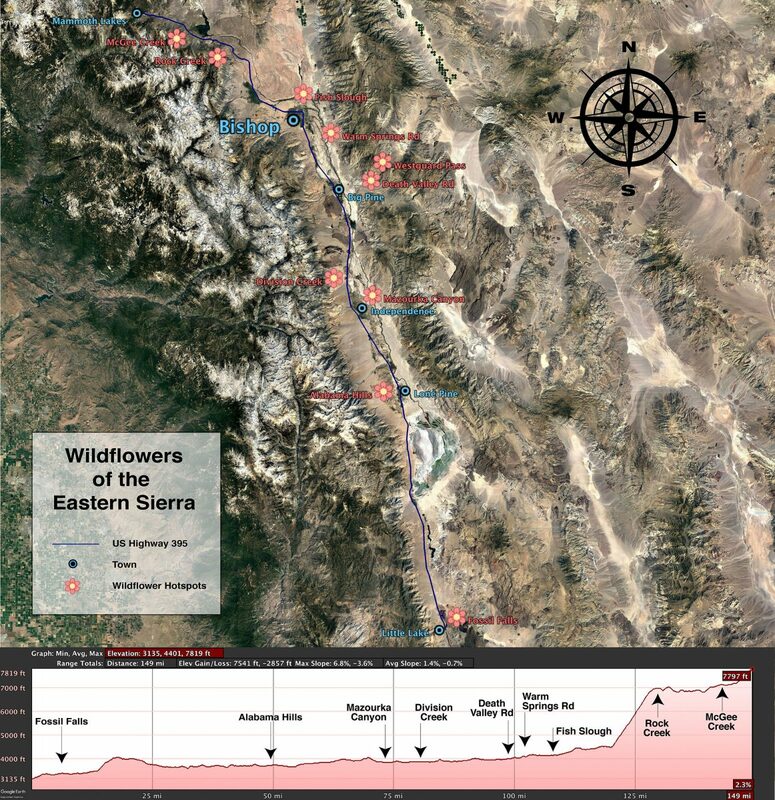 Hobbyists also read a little known gem entitled Wildflower Hot Spots of the Eastern Sierra produced by professional botanists. Anne Halford, one of the botanists, notes this booklet describes twelve wildflower sites which “highlights the unique geology, ecology and unparalleled flora along 150 miles of the Eastern Sierra corridor”. When visiting flower locations, please refrain from taking wildflowers home or back to camp with you. Flowers in the national parks are protected by law. Please be careful where you tread and don’t disturb the insects, birds and other creatures that depend on this vegetation to live. Wildflower enthusiasts don’t trample flowers, leaving them undisturbed for others to enjoy. Remember that the weather is quite unpredictable, especially in spring. Be prepared by dressing in layers and have a hat and sunscreen with you for the hot, sunny days. Wear sturdy shoes and have plenty of water to drink. 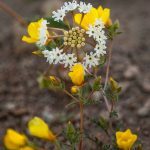 In addition to a camera and binoculars you may also want to bring a magnifying glass to study the tiny flowers and their exquisite features more closely. Bring a good field guide along for flower identification. 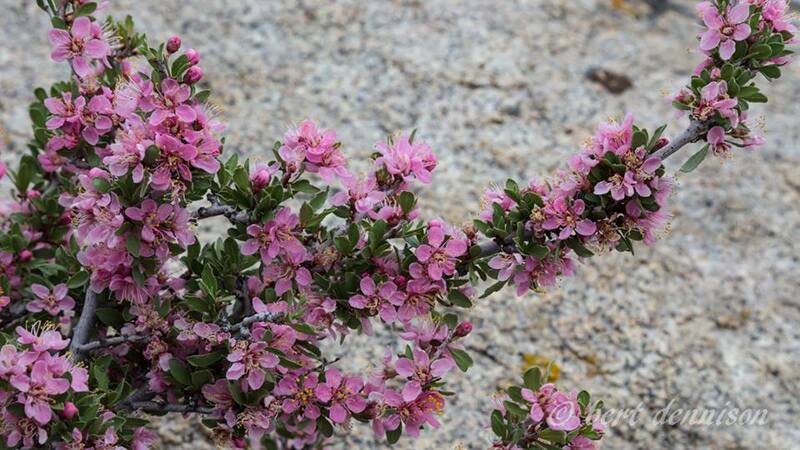 For updated information on the status of the blooms in the area stop in at the Bishop Visitor Center at 690 N. Main St or call (760) 873-8405. Take a look at these suggested spots for excellent wildflower viewing and photographic opportunities. A trip to Fossil Falls, a mere 1.4-miles off Highway 395, could deliver an expansive view of magnificent wildflowers. From US Highway 395 turn east on Cinder Road, 45 miles south of Lone Pine, and follow the signs to Fossil Falls. Plan your trip along this highway to include an hour or so to stop here and see this geologic wonder during wildflower season. Fossil Falls is magnificent example of the forces of nature that shape our world. Technically it’s not a fossil and water no longer falls here in any abundance. This surreal canyon of basaltic black lava rock is now a natural work of art beautifully sculpted by eons of rushing water from a prehistoric age. The chasm is almost unnoticeable in the flat lands of the valley floor until you get quite near to it, then it unfurls below you in folds of glossy, black rock that is both beautiful and strange. The rock is smooth and shiny and distinctly different from the surrounding landscape. During wildflower season the counterpoint of hard, black rock and soft, colorful petals is a reminder of time past and life renewed. The Alabama Hills, nestled in the foothills of the Sierra Nevada just west of Lone Pine, is one of Hollywood’s favorite filming locations. This monumental landscape provides a myriad of settings for movie backgrounds and evocative scenes. The beautiful rock formations of the hills bordered by a vast open plain rising majestically to the snow capped mountains beyond has been a prime filming location since the early 1900s. Although only a few miles from the town of Lone Pine this 30,000-acre protected area can give one the feeling of being ‘way out there.’ The stunning rock formations with numerous roads and trails winding through the area are a great place for auto touring, cycling, hiking, rock climbing, trail running, horseback riding, fishing, and camping. And … in spring … this is a magnificent place for wildflower viewing, studying, and photographing. From the heart of Lone Pine go west on Whitney Portal road then, 2.7 miles along, turn right onto Movie Flat road. Many dirt roads and trails intersect with Movie Flat road leading into the hills and among the boulders. Movie Flat road is a graded dirt road maintained for passenger vehicles. Take a look at our Alabama Hills National Scenic Areas overview page for more details about this incredible place. The route is 20 miles one way with the first 5 miles of the road paved. Thereafter it is a good graded dirt road that climbs to a little over 8,000 feet. Towards the top the canyon is narrow with steep sides and there can be snow on the road at the higher elevations during early season. Lower elevations here will produce early season blooms and higher up will bloom a little later. The views out across the Owens Valley are quite stunning anytime. Three miles south of Bishop is Warm Springs road. Turn east and head toward the base of the White Mountains. This could be a lovely early morning or late afternoon auto tour that might present some wonderful mid-season blooms. At the junction of Eastside road continue straight onto the graded dirt road, Black Canyon road that cuts across the alluvial fans that have spread from the canyons above. It is best done with 4-wheel drive vehicle. This five-mile section of gravelly dirt road cuts a swath through an abundance of exquisite flowers in early season bloom. Stop and take a walk and examine the small petals and soft color. About 35 miles south of Bishop is Division Creek Rd. A route of about 12 miles from the junction of Goodale Rd. and US Highway 395 west into the base of the Sierra Nevada brings you to a secluded high desert world. The road is paved along Goodale and Tinemaha roads, through Aberdeen, until you reach the Division Creek Powerhouse on Division Creek road. If you catch this right, the bush lupines will be bursting with blooms. Continue along the dirt road – you may need a high clearance 4×4 vehicle further along – and check out Scotty Spring and Spook Canyon. This road begins its westward route from just north of Big Pine. It is a gateway to so much adventure and discovery in the White Mountains that you’ll probably want to travel it often. 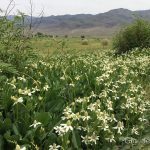 Flowers may be evident from the road as it crosses the Owens River during the latter part of the early season. Heading up into the White Mountains and over the range into Nevada is a good journey for mid-season and perhaps again in the later part of the flower season. Branching off from US Highway 168 on the west side of the Owens River is a sinuous path to the higher elevations of the Inyo Mountains. Near the summit the road junctions with the Saline Waucoba road that winds its way along the crest and down into Saline Valley in Death Valley National Park. Beyond the summit the road drops down into Eureka Valley and the Eureka Dunes. Within the first few miles of this quiet mountain road, buds will be blossoming in the washes and ravines in the latter part of mid-season to late-season. Rock Creek road, about 25 miles north of Bishop along US Highway 395, has been recently upgraded by the US Forest service. It runs for about 9 miles alongside the river in the narrow, steep sided Rock Creek canyon. Within this short distance from the highway, a diverse array of plant communities can be seen. An orchid and tiger lily bloom alongside the road’s edge where water courses down the canyon in small streams. The wildflower bloom will begin mid-season and continue well into the late season here. If good winter snow and rain falls after a warm summer it could produce a big bloom at the higher elevations along Rock Creek. Once the snows have cleared and hiking season begins, a short walk from Mosquito Flat (where the road ends) will take you over streams and through meadows where subalpine wildflowers flourish. The road to the McGee Creek campground and trailhead is narrow and winding. Up here the color that is visible year-round is in the layers of rock strata. In the flowering season though strokes and splashes of white, yellow, red and purple paint the landscape for only a brief period. The color revolution begins in early summer with a base of green that varies in hue and tint. Plant species range from the large cottonwood trees to groves of quaking aspen to the round sagebrush and elegant paintbrush down to a small white flower on a thin green stem commonly called “rays”.